This handout from WGAT-FM is 3.5 x 8.5. It dates from before 1972, when WJCW-FM became WQUT-FM. Check the mistake at 91.9 mHz. This entry was posted in Uncategorized and tagged dial card, Mutual Network, WGAT-FM Gate City VA, WJCW-FM, WQUT-FM on December 27, 2016 by Bob Lawrence. Another Haynes Distributing postcard, printed by Dexter, West Nyack NY. On December 4, 1967, that bridge, already 50 years old, collapsed when the driver of a 13.5 ton truck drove onto the 5-ton limit bridge. Someone had helpfully removed the load limit sign on the Long Island side of the bridge. 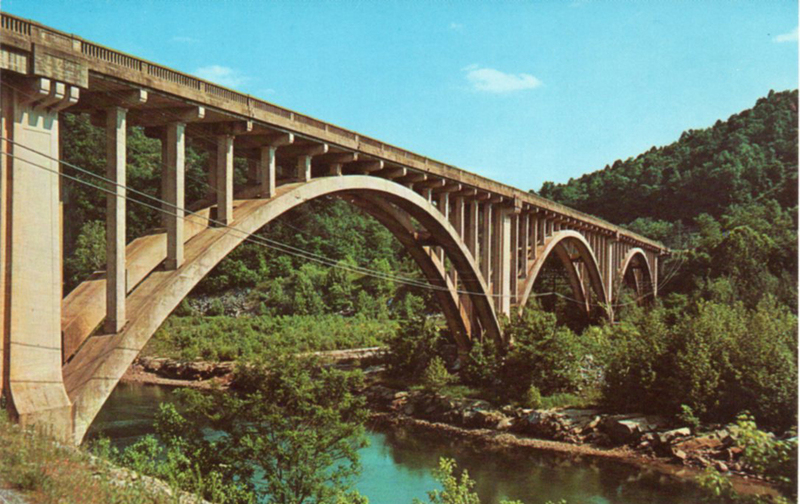 The driver, though quite chilled after the 30-odd foot drop into the South Fork of the Holston River, wasn’t hurt.Afterwards, Eastman firmly opposed rebuilding the bridge, citing things like height, depth, width, water, air, arm-waving and other important considerations. 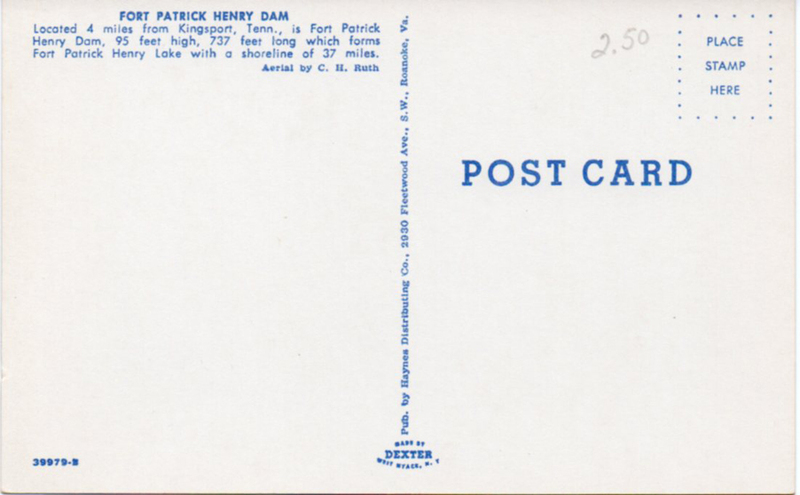 Since this card was mailed at the Downtowner Motor Inn, which wasn’t completed until 1962, the slightly non-existant postmark is probably 1965. And we all hope Mrs. Frisco got out real soon. 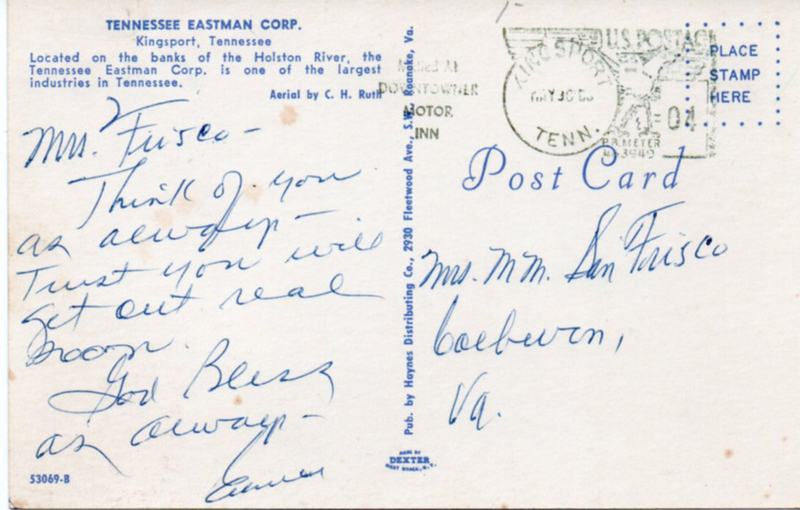 This entry was posted in Kingsport TN ephemera and tagged Dexter Printing West Nyack NY, Downtowner Motor Inn Kingsport TN, Eastman bridge to Long Island, Haynes Distributing Roanoke VA, Tennessee Eastman on December 23, 2016 by Bob Lawrence. I’m posting this not because it’s a fine, 1920s postcard, but because it was published by T. J. Stephenson and I finally know pretty much who this was. T. J. Stephenson was born in 1884 (thereabouts) in Virginia. He was, however, thoroughly Kingsport as a property owner (bought into the Hillcrest property when Federal Dyestuff company went belly up at the end of WWI), merchant (Baylor-Stephenson Furniture Store), an agent (Kingsport Mercantile Agency), member of the Board of Elections, a churchgoer (Broad Street Methodist), a city alderman, a supporter of the WCTU, and more. He seems to have been a pretty straight up guy. His first wife, Maxine, died somewhere in the 1920s. He was listed as “widowed” in the 1930 census. But he was remarried in the next census, to Pauline. T. J., jr. was born in 1908, but died after a “three week illness” in a Knoxville Hospital in 1936. He was working for Tennessee Eastman and, apparently, was well liked. There was another son and a daughter who went to school to learn the comptometer, an early mechanical computer. 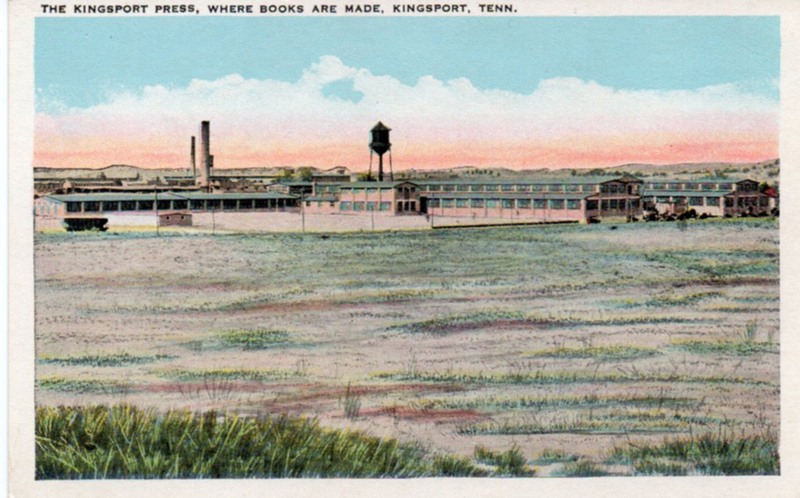 Since T. J. Stephenson was interested in Kingsport, my guess is that he is the one who commissioned Tichnor Brothers (out of Cambridge MA) to come take some black-and-white views of the growing city and have postcards printed. The cards were tinted prior to printing according to notes taken by the agent at the time the photos were taken. I don’t know how many cards are in this series. I have 18 and I know of at least one more. 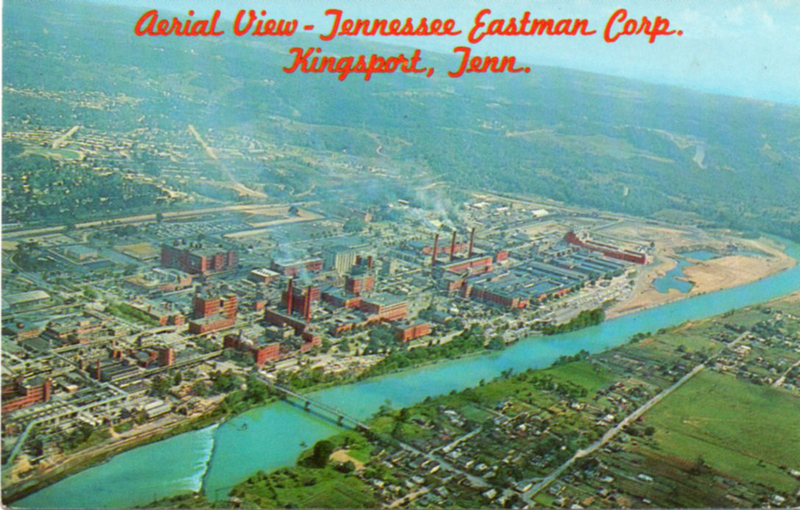 This entry was posted in Kingsport TN ephemera and tagged Baylor-Stephenson Furniture Kingsport TN, comptometer, Kingsport Press postcard, Mingsport Mercantile Agency, T.J. Stephenson, Tennessee Eastman, Tichnor Brothers Cambridge MA on December 18, 2016 by Bob Lawrence. This postcard is from the early 1960s. It’s a Haynes Distributing card with the photo shot by C. H. Ruth. Ruth and Joyce L. Haynes shot a lot of film in the Kingsport area around 1962. Note that the visitor center is not there yet. 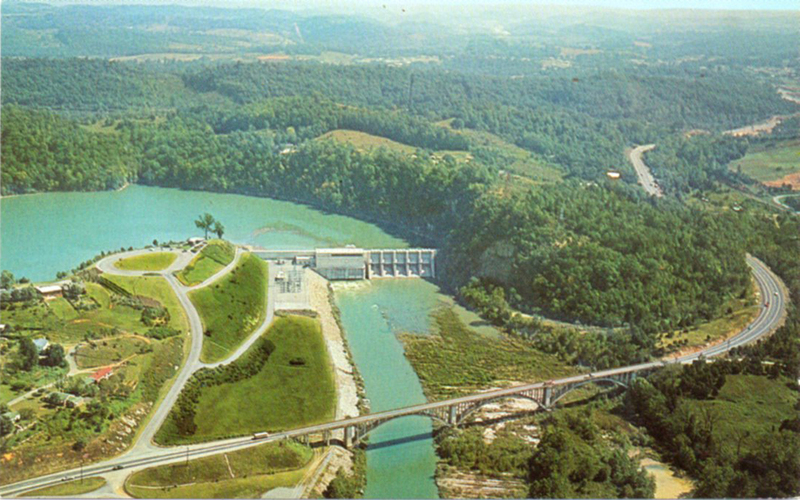 This is nearly 10 years after the dam was finished. I like the lone tree sticking up on top of that hill. This entry was posted in Kingsport TN ephemera and tagged C.H. Ruth, Ft. Patrick Henry Dam Kingsport TN, Haynes Distributing Roanoke VA, Joyce L. Haynes on December 13, 2016 by Bob Lawrence. Calvin Sneed’s posted this 1929 bridge here with all the appropriate descriptions (Calvin knows more about bridges than anyone else I know – given that I don’t actually know a lot of people who have any interest in bridges, but, Calvin, he’s a bridge boffin straight up. At the time this postcard picture was taken (1961 or 62)*, the bridge was two-way. When I got out of the service and got a job, I bought a 1966 Volkswagen. Even with that car, this bridge was a white-knuckler if a truck was coming the opposite way when it was snowing, in the dark. Anyway, I think this bridge is utilitarian, rather than “magnificent”. This view is looking east. In 1969, they built the wider steel bridge, just to this side of this one. Whew. Incidentally, this bridge replaced a 1900 Pactolus Ferry bridge, which crossed the Holston River near (my correction to earlier prepositions) where the Ft. Patrick Henry Dam is now. Before the bridge, there actually was a ferry there. *Haynes Distributing Company in Roanoke had their photographer/agent Joyce L. Haynes in this area in 1961 and 1961. Shooting Kodachrome, probably. 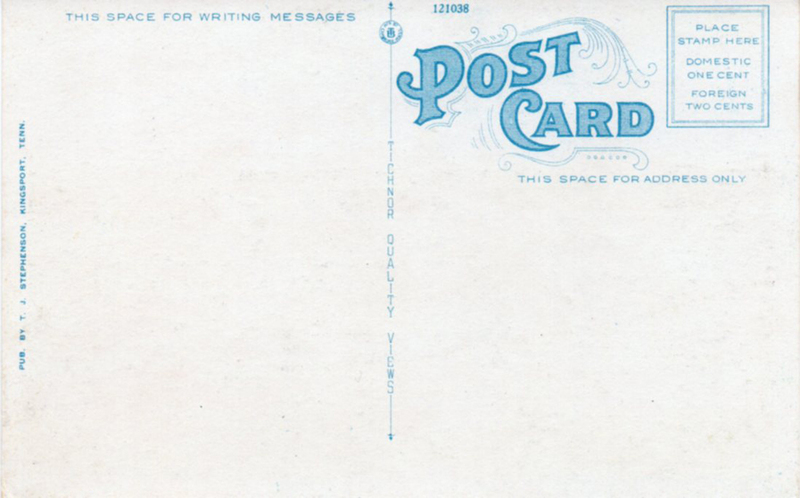 This type of postcard is called a “chrome”. 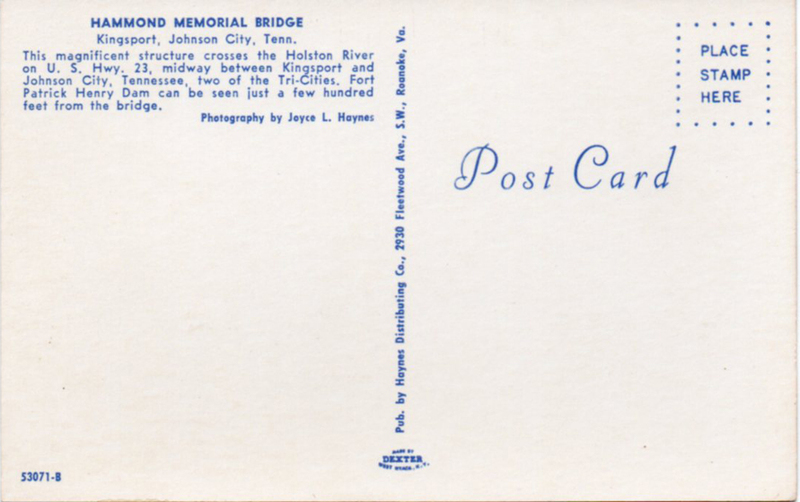 This entry was posted in Kingsport TN ephemera and tagged Calvin Sneed, chrome postcards, Ft. Patrick Henry Dam, Hammond Bridge Kingsport TN, Haynes Distributing Roanoke VA, Holston River, Joyce L. Haynes, Kodachrome, Pactolus Ferry bridge Kingsport TN on December 9, 2016 by Bob Lawrence.